Go to a schoolyard and watch the 8-year old boys play. You’ll find at least one acting out some military fantasy where he makes explosion noises with his mouth and deepens his voice to shout jargon (e.g., “negative on the evac,” or “It’s not about saving your life, ma’am, it’s about getting a job done”). Now give that boy a multi-million dollar budget and Bruce Willis in a leading role and you’ll get something like Tears of the Sun. 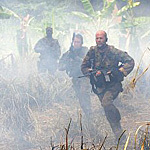 Bruce Willis stars as Navy Seal leader A.K. Waters. His mission is to take an elite force into the jungles of Nigeria, where rebel forces are approaching an American mission. He must extract an American doctor, two nuns, and a priest, and bring them back to safety. Dr. Hendricks (Monica Bellucci), who just happens to be an exotic beauty with a barely-buttoned blouse, refuses to leave without the native mission workers. Waters humors her, marching the refugees for two days to the rendezvous point. Once there, Waters and his men take Dr. Hendricks on a helicopter and leave without the natives, who are now betrayed, exhausted, and two days from home. Before they make it back to the aircraft carrier, Waters has a change of heart. He turns the helicopters around and goes back to save the refugees. The rest of the movie is a long chase. Waters and his dozen men march the refugees toward the border of Cameroon while the Nigerian rebels pursue them. Why do the Nigerians bother? Because among the refugees is the last blood heir of the Nigerian president, the only man who can make Nigeria safe for democracy. Protecting a blood heir in order to preserve a democracy might have been a delicious irony in a smarter film, or in one based on actual events. But in this overly macho work of fiction, it feels like sloppiness, not intelligence. Three Kings this ain’t. Think of Three Kings and you might imagine all sorts of questions that this movie could have asked, but didn’t. For example, what are the consequences of calling an American airstrike against Nigerians pursuing their own “criminals” on their own soil? Should you really save the life of a political leader solely for humanitarian reasons, ignoring the political consequences of returning him to power? What punishment will Waters, a mid-level officer, have to face for disobeying orders when he gets back home? These questions are not answered, nor are some of them even asked. There is only one moment where I thought the film had something insightful to offer. Waters asks his men whether they will support his decision to save the young “prince,” along with the rest of the refugees. After most of the men agree for reasons of duty or loyalty, one man says that after all the years America has ignored political strife in Africa, he was glad to finally be doing the right thing. His statement carried moral weight, not because he was the token African-American, but because he was the character who had studied politics and had put some thought into his decision. But on the whole, Tears of the Sun isn’t interested in politics. It is content to be an 8-year-old on the playground, making explosion sounds with its mouth and spitting out tough-sounding jargon. bruce fan: your review doesnt describe at all really how the movie is.